In which we are beset by festivity; Scott Summers still can’t take a vacation; the Daysprings are a really good family; “G’journey” is a really good greeting; Stryfe is his own namesake; retcons have served Cable well; illustrator David Wynne makes his X-Plain podcast debut; and you should probably go ahead and get a shelf for all these awards. CORRECTION: In this episode, Miles states that Scott and Jean are cool. They are, in fact, categorically uncool. We regret the error. Special thanks to carolers Tina Carleton, Matt Gardner, Peter Gresser, Erin Pence, and Steve Pence! Check out the visual companion to this episode–along with all the song lyrics and the complete Corbeau awards–on our blog! Thanks you for reminding me that my brother and I “G’Journey”ed for years. This miniseries came out right before I started collecting X-Men comics so I’ve only known it through its legacy. I’ve never really known how good or bad it was, but I’ve hated it for years because it took Rachel Summers off the board for the better part of a decade. It’s important to remember that this was a time when it was not as obvious as it is now that no end to a character’s story could ever stick and no death could ever be permanent. For instance, Barry Allen was still blissfully and wonderfully dead, as he should have stayed. So there would be every reason for writer, editor – and readers – to accept that this very final Rachel story was indeed final. So why? I get that Lobdell didn’t want to use her in Excalibur, and that there’s an element of One-True-Phoenix-ism (=Jean) about this story, but there are ways to take a character off the board that are a good deal less decisive than this intends to be. So why this? I suppose I can see the argument that, since Davis had had her save her DOFP future, Rachel’s story had effectively ended already, but still. At any rate, I don’t think the character has ever recovered – having so much of her development happen in Excalibur already marginalized her, and this appears to have been the final straw. I always thought that removing Rachel was to get rid of another chronologically displaced character ahead of Age of Apocalypse, where it was highly relevant that Bishop was the only ‘man out of time’… But am I giving editorial too much credit for forward planning? I still have the old back issues of Excalibur once Rachel left after #75, and they always insisted on response to reader letters that she might one day return. Do any interviews at the time shed any light? I deeply appreciate the work,thought and love the X-plain The X-men team puts in these episodes every week. 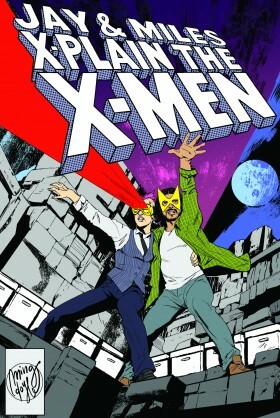 Your podcast not only gave me a deeper appreciation for the x-men, but to comics as a medium itself. Thank you. I’ve never been myself, but from everything I’ve heard. “Thought Bubble” would be the perfect place for Jay and Miles to go intercontinental! I just checked the Thoughtbubble site to see if tickets are on sale yet for this year. I’ve been five times in a row and look forward to it a lot. I like the wealth of great independent work I can pick up there, that the international guests are creators doing their best work now or may still have it ahead of them (not always the case in the UK), it’s increasingly international feel- I especially enjoyed talking with artists from Finland and Peru last year- and it generally safe and friendly feel. You guys coming would be more icing on a cake that’s more fondant than sponge already. I really loved Adventures of Cyclops and Phoenix and I wasn’t sure if you guys would love it as much as I did so I want to thank you for that. I also have to thank you for telling me about a Daredevil podcast. I had no idea this existed! I think our hosts made a very good case for this miniseries as a better idea than I felt it was when I was reading it. I will be curious to see, going forward, how well later development does in joining up this Cable and this Stryfe with the much older ones that we already know. Stryfe in particular seemed a difficult retcon to make work, but with several decades of character life with which to work, the two Stryfes can probably be reconciled. Still, there are some problems here. As so often in this era, they feel as much like problems of editing as problems of writing – places where Harras should have sent the script back to Lobdell and pointed out that this or that needs fixing. Some are trivial: “tenants” for “tenets.” But there are some crucial plot points here that needed more thought. First, everything in this plot turns on the idea that Stryfe is not a substitute for Nathan. So what does it *mean* to say that the clone has the “ability” to host Apocalypse, but not the “capacity”? Second, Ch’vayre’s motivation is daft. There is literally dialogue to justify his switching sides in which he says that he thought that when Apocalypse talked about survival of the fittest and that the strongest should dominate, what Apocalypse meant was peace, love, and understanding. On the one hand, how could Ch’vayre possibly think that? And on the other, that was not how Ch’vayre was presented in issue 1 – there was absolutely no sign that he was confused about how things were supposed to work. These are narrow specific points, I realize, but what they have in common is that (a) they’re material to the plot and (b) could be easily fixed by rewriting the dialogue. More broadly, I hate the Apocalypse retcon, because it’s so insensitive to Louise Simonson’s vision for the character. There is perhaps no X-antagonist for whom the idea that he vampirically moves from host body to host body is so inappropriate. This is true on a narrow continuity level: the whole point of Apocalypse’s powers is that he has absolute control over the molecules of his own body — he’s the Molecule Man, but only for his own molecules —, and therefore doesn’t *have* this sort of physical limitation related to his body. But there’s a less nitpicky aspect to which Apocalypse’s powers contribute. Simonson’s Apocalypse isn’t about his own survival (in part because, with his powers, he doesn’t have to be – he’s immortal and invulnerable to almost all conceivable threats). He’s a ‘70s Jack Kirby character injected into the X-books, tied to the Celestials. He illuminates how Kirby was exploring similar ideas in some ways in his ‘60s X-Men work and in his ‘70s Eternals work, and by joining them up contributes something that Kirby himself wasn’t suited to do. As a character modelled after ‘70s Kirby characters, Simonson’s Apocalypse isn’t *selfish*. He represents an outlook on life taken to a purer, more “mythic” level than in a “rounded,” “complex” character. Apocalypse genuinely and wholeheartedly believes in his vision, in a way that is not so much idealistic as idealized. Having him rant at the dead Xavier is definitely a false note for me. For all the ways in which it’s a really bad instance of a misguided move away from Simonson’s characterization, but also because it’s part of that whole “Everything *has* to be about Charles Xavier” thing that makes the X-books seem, at least to me, a little cramped and self-limiting in this era. Thank you for articulating some of my narrative issues with this series way better than I could. I was never that pleased with Rachel giving Jean the Phoenix name. Rachel had been a much more interesting character than Jean had ever been, so this did not seem like a fair trade off. It felt more like a determination to continue the trademark than something important to Jean. I’m also never certain about stories where people live for years in an alien realm and then return when moments have passed. I had the same issue with the Narnia books, and ST: TNG’s “The Inner Light”, a magnificent performance from Patrick Stewart not quite compensating for the fact that Picard now has sixty new years of completely different life experience suddenly thrust into his mind and he hadn’t seen his crewmatesin all that time. Changes that big should leave bigger ripples than they are normally shown to. Having recently binged most of Doctor Who, I have seen this a *lot* recently and I hate it. First off – thank you both for being such prolific and intelligent commenters, Voord 99 and Icon_UK! Nary an episode passes where I don’t read something one of you wrote and wish I’d thought of it that way while we were recording. To briefly chime in on Apocalypse’s portrayal in this story – I actually really dig his shift in characterization from misguided-but-pure visionary to pitiful old hypocrite. I always found that move to be compelling – the idea that ideals can take a person far, but as the power to back up those ideals fades, or simply as mortality approaches, one can find ways to rationalize away all sorts of behaviors that never would have flown before. For me, that adds another layer to the long-lived Apocalypse – it humanizes him – and it also makes the Ch’vayre face turn somewhat more believable. Maybe how much that plot element works for me has to do simply with the fact that I grew up on this era of X-Men and was thus inclined to just go with whatever changes happened. I was reading 70s and 80s X-books simultaneously, sure, but there was less of a sense of history being contradicted – all of those eras had equal weight in my young mind, even if some 90s bits were too nonsensical or Liefeldy even for me. After all, I can’t stand Magneto’s character assassination in Morrison’s run – perhaps if *that* had been my era, I would have minded it as little as I mind the equivalent happening here to Apocalypse! embarrassed mumble… thank you… embarrassed mumble… standing on the shoulders of giants… embarrassed mumble.. etc.. Seriously though, this is always a fun forum! Quick, Icon_UK, let’s talk about classic British sitcoms so that he stops reading! But, seriously, thank you for the kind words. This podcast goes to the head of my listening queue the moment it comes out every Monday. I’m not sure what you mean by “Mobius-like architecture”. Are you referring to Sonic the Hedgehog, or the mathematical construct, or is this a reference I’m unfamiliar with? I do not have the words for how happy I am that you got the Floating Hands guys to sing X-Men Carols. That WAS awesome, and actually prompted me to go and see if there were any new Floating Hands X-Men vids I hadn’t seen yet, AND THERE WERE! Oh no, I’m gonna have to explain to coworkers why I’m crying at my desk over a 25-year-old X-comic. Again. With me that would be tears of helpless, hysterical laughter, I’m afraid. At least right now. I’ll be interested to see if this will be another occasion on which our hosts persuade me to look at something differently. “One must have a heart of stone to read the death of Little Nell.. Exactly. And as with Wilde, there’s an element of hyperbole to the way I put it. But UXM #303 is for me a good illustration of the fact that sentimentality is like striking at the king — you can’t miss. Wow, a lot of cynicism & snideness towards a genuinely moving comic issue (albeit one with inappropriately Image-esque art). I guess cruelty & callousness is still considered a mark of “maturity”, or it’s people who haven’t read it & are just parroting WRA. Also, re: Inhumans… Jay’s comments about what is a newly-emerging community not “counting” as a demographic despite only recently becoming a visible presence of any sort reminds me too much of the gatekeeping asexuals & non-binaries experience, complete with declaring we aren’t “really” oppressed enough to count as part of the LGBTQIA+ community. It was actually kinda hurtful. I’m sure I’m the only one who saw that parallel, but it still stung from the familiarity. I’m not sure what “WRA” means in this context (I suspect not the “Welsh Revenue Authority” though). Assuming you’re referring to the upcoming issue rather than this one, then I think it depends on what one consider to be “genuinely moving”, and what one might consider to be the very cynical narrative exploitation of a young, adorable, and long established child character being used to demonstrate the deadliness of the Legacy Virus. But as has often happened in the past, I’m hoping that seeing it through the fresher eyes of Jay and Miles will open it up in ways I didn’t see when I read it when it first came out. As Icon_UK noted, I was in fact parroting Oscar Wilde, and as I said, the hyperbole was meant to be taken as hyperbole, just as Wilde’s was. I’ll note that Wilde wrote this to Ada Leverson – it’s one figure who was marginal (in certain respects – this is a complex question with Wilde) writing to another figure who was marginal in different but parallel respects (Leverson was a Jewish woman) — among the things that is going on there is an awareness of how sentimentality can be wielded to exclude and marginalize. But anyway, let me put it this way. Do you feel moved? Probably not. It’s the selection of detail, how the story is told, that works for you. Or doesn’t. For me, this really doesn’t work. I won’t go into all the things that bother me (although you’ve mentioned one of them, the horribly inappropriate way in which female characters are depicted), because maybe our hosts will persuade me that some or all of them are not things that should bother me. But overall, I find this to be written by the same Scott Lobdell who wrote The Last Morlock Story, someone who is simply lazy and obvious far too often. And because of the subject-matter and the way in which the comic presents itself as being profound and meaningful, it’s more than a little offensive to me that Lobdell can’t be bothered. I have the same sense of a text that defines its implied readership with contempt. But that’s me. A lot of this has to do with the way that stories about the death of children are an area where I’m particularly sensitive. I loathe stories where the child — you know, the person who is actually supposed to be dying —is reduced to a cipher, a sort of button marked “Feel sad!” for the writer to press. Here with added fridging, just to twist the knife! If you want an example of an X- story that I do find moving, New Mutants #145 (the Larry Bodine story). It does all sorts of things right that this story really does not, for me. Why did you guys first start the podcast? were you listeners of the other X-Pods b4 you started the show? Do you listen to any of the other X-Pods now? Surely u have heard of the Uncanny X-Cast? That was the first X-Pod.